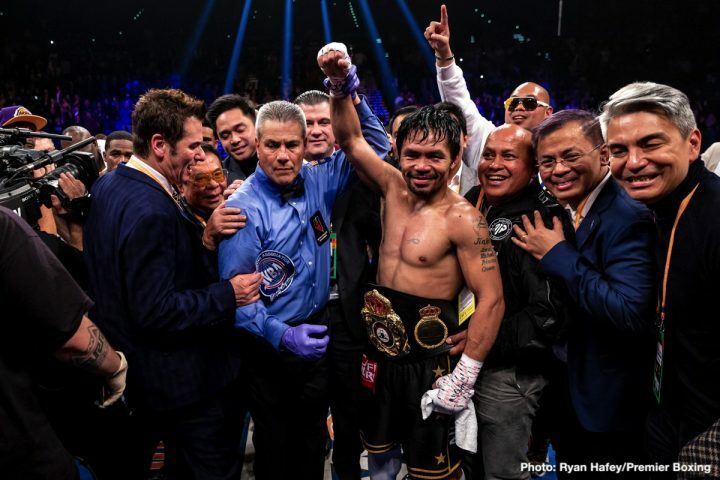 By Allan Fox: WBA World welterweight champion Manny Pacquiao was ill with a bad cold last Saturday night, but he was still able to beat challenger Adrien Broner by a 12 round unanimous decision at the MGM Grand in Las Vegas, NEvada. In the post-press conference Pacquiao revealed that he fought while sick with a cold, and he had to leave early. Pacquiao looked very sick during the post-fight press conference. He was blowing his nose, and he looked like he needed to go home and rest. As sick as the 40-year-old Pacquiao looked, he fought incredibly well in pushing the fight all night against the younger and presumably healthier Broner to win a wide 12 round decision by the scores 117-111, 116-112 and 116-112. It would be interesting to know if Broner, 29, noticed that Pacquiao was sick during the fight. If so, why didn’t Broner point it out to his trainer so that he could come up with a different game plan that involved more pressuring instead of lying back against the ropes, and letting Pacquiao be the aggressor in the fight. Looking Pacquiao before, during and after the fight, it seemed obvious that he had a bad cold. Broner should have been able to take advantage of this if he had his eyes opened, and if he was able to become an aggressor. Since moving up to welterweight, Broner has been more of a counter puncher compare to the aggressive fighter that he was when he was fighting at the lower weight classes at 130 and 135. Pacquiao being ill makes his performance against Broner all the more special. To fight the way Pacquiao did looking as ill as he was, it’s very impressive to say the least. Pacquiao showed a lot of guts just to go out there and fight as sick as he looked. A lot of fighters would have postponed the contest for a couple of weeks until they were healthy before they fought. As far as how Pacquiao suffered the illness, it’s possible that all the running that he did in the rain and the cold outside during training camp could have led to him suffering the cold. In hindsight, it would be better for Pacquiao to run on a treadmill inside in a controlled temperature environment rather than outside in the elements. If Pacquiao is going to train outside, he should be in a warm environment like Palm Springs, Las Vegas or Arizona. Pacquiao says he felt he could have knocked Broner out at one point, and he was thinking about doing that but his cornerman Buboy Fernandez talked him out of it.